Software engineers often think about starting a web development business of their own. We may be talking about a traditional senior software developer working on a product after hours. No exposure to marketing and sales at work. Traditional Computer Science degree. Complete focus on software engineering. They launch a product and probably sell through their own network or social media accounts. A couple developers join the team, assisting with additional features, maintenance, deployments. Have you started your own business as an engineer (or considered founding one)? The beginning is always tough – you need to find your place in the industry, generate some income and plan for recurring revenue. When you can plan a few months ahead, you can start growing your team as well, with other experts helping you build more products, double the amount of work you do or anything that you offer to your customers. Which is why sales is among the 7 pillar categories of the biggest business problems in the world. After getting a few people on board, you usually have to start looking for other areas that are not directly related to your work. Two of the key areas that I will be talking about in this article are the management and sales areas of a web development business, focusing more on how the latter can be explored by a technical head with no sales background. The video primarily talks about our processes as a web team combined with some strategies on hiring workforce and handling specific types of activities. While my presentation is stressing on recruitment and management advice, there are numerous key pieces determining the business development aspect of growing a leading international tech company. This is the main workflow I’ve followed as a freelance developer before I founded my business and grew it to a team of 30+. It’s still applicable in terms of scaling opportunities. – The process of interacting with prospects, assessing a business model, identifying opportunities and ensuring that the client is a good fit. Once you get some traction, working with the right clients is extremely important. One problematic client can easily sink your entire business. – Since you’ve already closed some leads, building an outstanding customer experience is of utmost importance. Happy clients can convert to a recurring business opportunity, sending testimonials or even referrals to your business. 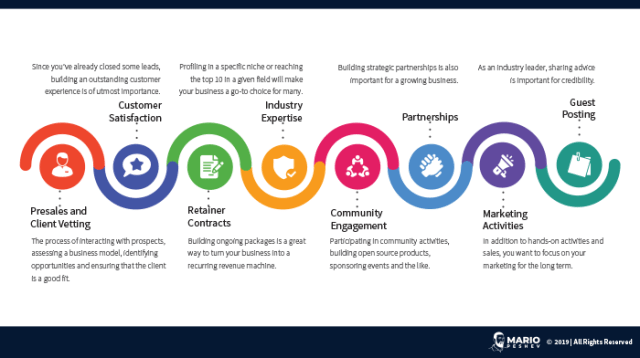 – Building ongoing packages is a great way to turn your business into a recurring revenue machine. Instead of bidding on fixed-fee projects alone, discuss ongoing opportunities, maintenance work, regularly scheduled redesigns or new integrations with products that stand out. Some of our “one-off” clients have been working with us for 3 years and going thanks to our retainer agreements. – Profiling in a specific niche or reaching the top 10 in a given field will make your business a go-to choice for many. Instead of building solutions for a wide range of platforms, pick one or two and become extremely proficient. Understand the underlying layers, take certifications, build some high-scale projects and showcase them as proof of your quality work. – Participating in community activities, building open source products, sponsoring events and the like. If you’re doing web development for a living, it’s only natural that you would be naturally inclined to engage with other industry peers. Connecting with hosting companies, product developers, core contributors in your field is an important channel for upping your skills and increasing your value as a vendor. Plus, it reveals additional opportunities for large businesses looking for reputable service providers. – Building strategic partnerships is also important for a growing business. If you offer back-end development services, partner up with front-end developers or design companies. If you are a full-stack team, talk to SEO agencies, creative studios, advertising companies that often get pitched for web development. 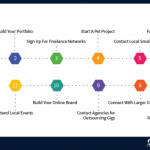 If your portfolio is solid, you have a chance for building new recurring sales funnels and cross-promote your services out there. – In addition to hands-on activities and sales, you want to focus on your marketing for the long term. Start a newsletter, build ebooks and whitepapers, build your social media accounts, craft some designated landing pages, create a freemium software – plenty of opportunities to increase your traffic and convert some of your readers into prospects. – As an industry leader, sharing advice is important for credibility. Talk to industry blogs and magazines and suggest topics which would be of use to their audience. Not only can you reach a wider audience, but backlinks to your site will increase your visibility in SERP. The further you specialize and build your professional brand, the more your business will shift to inbound leads instead of cold calls and emails. This will let you discuss ongoing retainer opportunities which will grow your monthly recurring revenue, letting you hire additional resources, invest in complementary tools for your business and spend money on ads and partnerships. How can you build a successful business as a software developer if you are not a sales person? Of course, the tricky question is – how to land repetitive customers? I have discussed in the video below the different techniques for introducing salesforce to your business, as a technical expert. Their lack of marketing and sales experience will definitely be a blocker. Digital marketing covers a wide range of skills – content production, email marketing, affiliate and partnerships, social media, analytics, setting KPIs, tracking and launching new campaigns – you name it. Sales works in a similar manner, too. An inbound sales person should handle the incoming leads via email capture or contact form submissions through landing pages, freebie offers, webinars, partnership campaigns. An outbound salesman will engage in cold calls and emails, attend industry events, explore prospects on LinkedIn. That’s why plenty of startups are formed by multiple co-founders responsible for different portions of the business. A trustworthy expert in business development may be instrumental for a similar role. However, technical CEOs may have some exposure to marketing and growth. Working on projects for marketing agencies. Building products or SaaS solutions together with their marketing teams or an external marketing firm. Attending industry events and interacting with prospects and clients on-site. 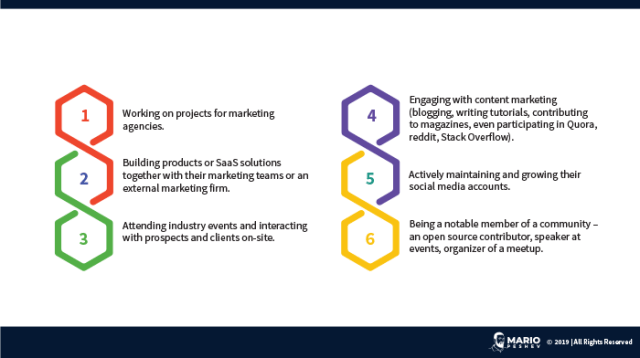 Engaging with content marketing (blogging, writing tutorials, contributing to magazines, even participating in Quora, reddit, Stack Overflow). Actively maintaining and growing their social media accounts. Being a notable member of a community – an open source contributor, speaker at events, organizer of a meetup. Those bits may determine the business plan of the startup and uncover successful strategies that could be explored at the very beginning. I’ve hired marketers and salespeople who didn’t live up to the expectations. They promised a lot but couldn’t deliver. We spent tons of capital with no ROI whatsoever. Over the past 5–6 years, I had to delve deeper and deeper into sales and marketing. I went through rough times while we were generating a loss. I was already into blogging and social media, but didn’t really understand what converted and what didn’t. We took on a couple of marketing platforms and I had to study marketing extensively. I hired a couple of writers for our blog after writing 40 posts myself (after a thorough keyword research, browsing BuzzSumo for successful titles that convert, looking up our competitors via Moz and SEMrush). I spoke to marketing consultants on Clarity and business developers in my network. Same goes for successful business and agency owners willing to share some tips. We finally had the data we needed in order to understand what’s worth investing in further. I worked on a detailed document explaining our marketing initiatives and ideas for expansion. The list goes on, but our “trial-and-error” led to a better-structured model. Close.io also suggest a similar model when hiring a salesperson. The CEO should be the best salesperson. There’s hardly any way around it. The CEO should be the best salesperson. Once you have the background in place, you can hire someone who can follow the successful steps and expand further. It’s an easy way to evaluate the process and see if they add any value. Otherwise, partnering up with a consultant, hiring a co-founder, or blindly relying on someone who seems trustworthy seems to be the only options. Who runs sales in your team? The post Sales And Business Development Tips For Tech Companies appeared first on Mario Peshev. The article Sales And Business Development Tips For Tech Companies appeared first on DevWP.eu.